A whole world awaits you in Southeast Europe. Long closed off to the west by communism and a series of wars, it is Europe today but at half the price. To call it undiscovered doesn’t do it justice. People have lived on the Balkan Peninsula since prehistoric times. It was the first area in Europe where humans started to farm. It’s where advanced civilization is thought to have started. 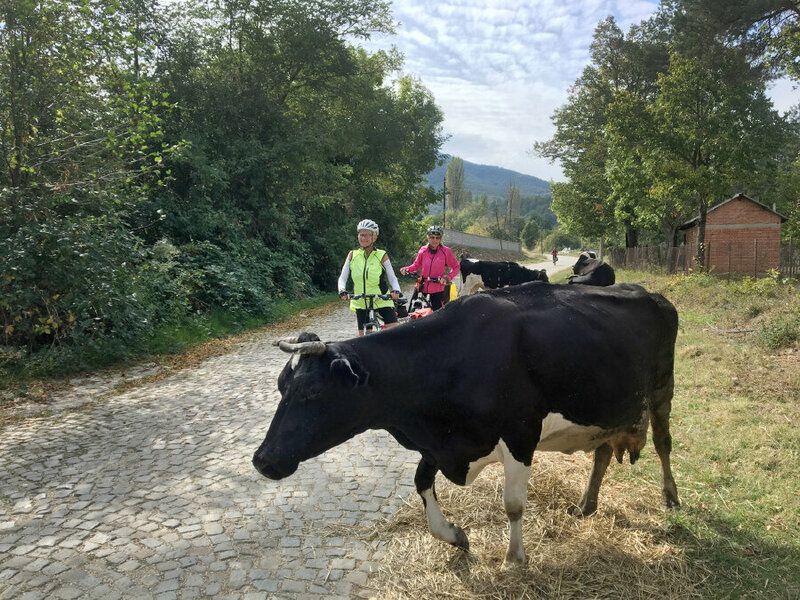 Now the region is safe and beautiful – full of unspoiled natural resources, fascinating cultures divided by national borders and an endless series of back roads with little motorized traffic – all begging to be bicycled! Rolling hills with some flat sections and two longer climbs that can be missed by shuttling. Moderate cycling level. 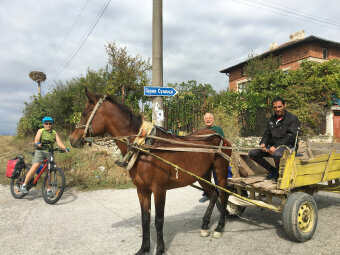 12 nights lodging, 12 breakfasts, 8 lunches, 11 dinners, snacks, van support, mountain bicycle, guided walking tour of Ohrid, wine tastings, cheese tasting, boat trip, cooking class, airport shuttles, and trained bilingual guides. Mountain bike is included, as the roads are paved, but rough. Fly into Skopje, Macedonia and out of Sofia, Bulgaria. There are no direct flights from the USA, but there are connecting flights to both cities through Vienna and Istanbul. The biking was beautiful, maybe even more beautiful than I expected. Culturally, it was lovely. The places we stayed were amazing. Quite a treat! Tour leaders couldn't have been better! I loved all our Macedonian guides! 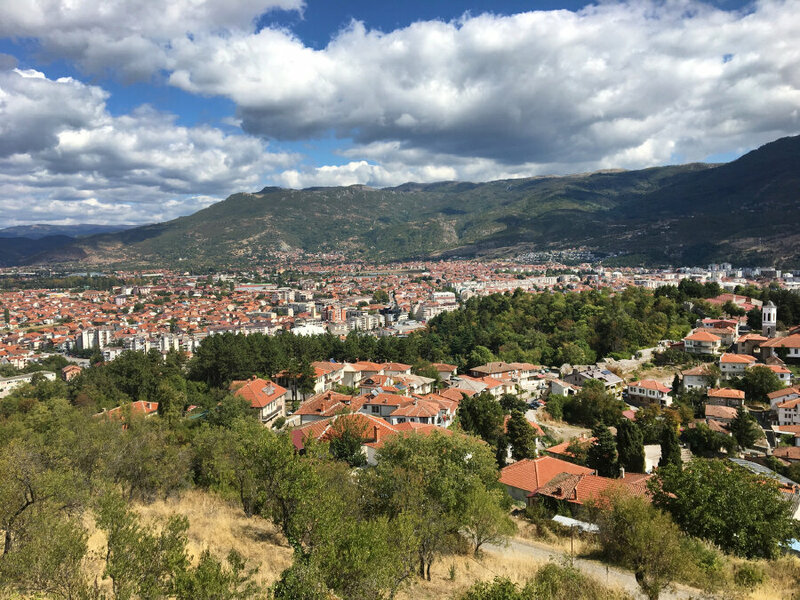 DAY 1: We’ll meet you at the airport in Skopje, the capital city of Macedonia. 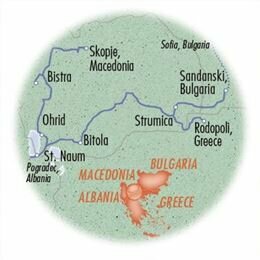 With a population of only 2 million people, tiny landlocked Macedonia shares a border with five other Balkan countries. It’s the perfect place for our tour of the region. From there you can take a walk across the 15th century Stone Bridge to the Old Bazaar on the other side of the Vardar River. This area has been a merchant’s quarter since the 1100s and is filled with narrow cobblestone alleys lined with small colorful shops perfect for exploring. If you’re too tired to walk, then simply sit at an outdoor café along the central square to people watch. We’ll meet at 5:00pm at our hotel for an orientation. Then we’ll have dinner together at a reconstructed inn from Ottoman times. 0 miles. DAY 2: After breakfast, we’ll get fitted to our rental bicycles and then start with a stroll through the city. We’ll stop at a couple key sites as we make our way out of town on a bike path. We’ll cross the Treska River on a pedestrian bridge as we head toward breathtaking Matka Canyon. The beautiful canyon is home to nearly 100 different species of butterflies. 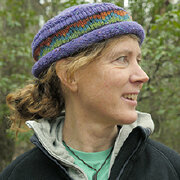 Many of the plant species here are found nowhere else in the world. We’ll have lunch at a restaurant built into the rock wall overlooking the river. Then we’ll take a boat ride up the narrow canyon to Vrelo Cave, believed to be the deepest underwater cave in the world. A quick shuttle will take us back to Skopje where we’ll have dinner at a restaurant in the bohemian district. 17 miles – 4 hours. DAY 3: After a morning transfer out of the city to Mavrovo National Park, we’ll start cycling downhill, stopping for lunch at a shepherd’s home. You’ll learn quickly that everything tastes better with a shot of the homemade brandy called rakia. You may even be able to try your hand at milking a sheep before dinner tonight. 19 miles – 3 hours. DAY 4: After breakfast, we’ll start cycling through a gorge following the Radika River. At the end of our ride, we’ll hike to the beautiful Duff Waterfalls. After a picnic lunch, we’ll head to one of the most important shrines in the country. The Rajcica monastery has the remains of the hand of St. George from the 4th century embedded in gold-plated silver. We’ll overnight in local guesthouses where we’ll dine on locally smoked meat, homegrown vegetables and homemade wine while enjoying a performance of folk dancers. 21 miles – 3 hours. DAY 5: After breakfast on the balcony of one of the guesthouses, we’ll walk to the springs of the Vevchanska River and then to the center of town to retrieve our bicycles. 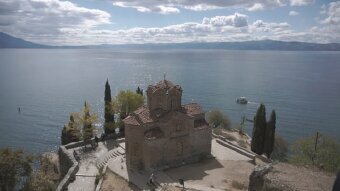 Our ride will take us past cave churches built by monks centuries ago in the rock wall overlooking Lake Ohrid. Then we’ll cycle along the lake on a bike path, stopping for lunch before finishing in the town of Ohrid. 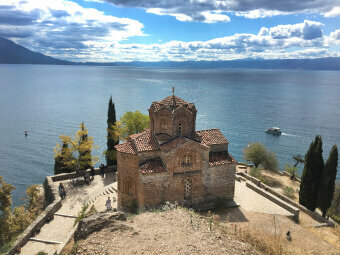 Lake Ohrid is one of the oldest and deepest lakes in Europe. It was declared a UNESCO World Heritage Site for its biodiversity, but it is also simply a beautiful lake. Low mountains surround the clear deep blue water. Our hotel for the next two nights sits on the banks of the lake. 36 miles – 5 hours. 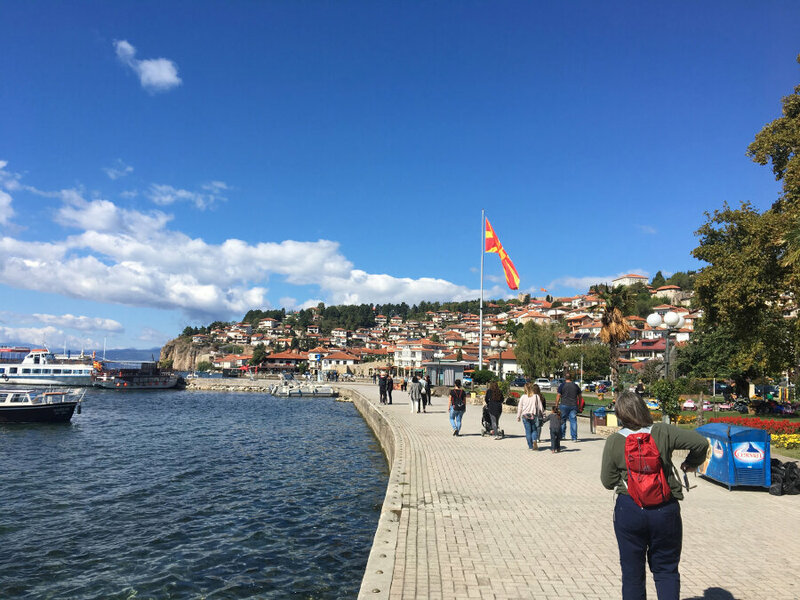 DAY 6: Our layover day in Ohrid will start with a guided walking tour of this historic town. We’ll see the most photographed church of the Balkans and walk around the Hellenic Theater, still being used today for outside performances and built more than 2200 years ago. The afternoon will be yours to explore the hidden alleys of this charming town. 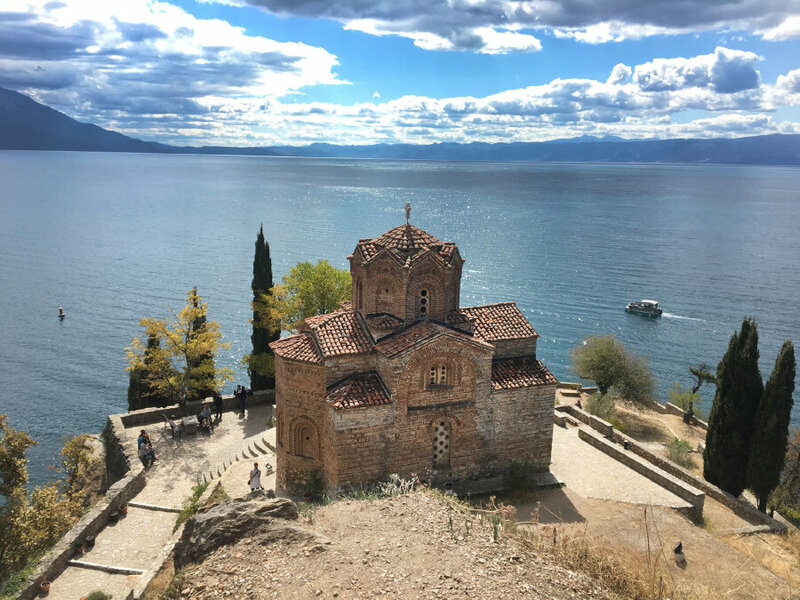 Visit the handmade papermaker, shop for world-famous Ohrid pearls or find a hidden restaurant behind a cliff wall and sip a drink staring out at the serene lake. 0 miles. DAY 7: We cycle out of town after breakfast on a bike path along the shoreline. Before we know it, we’re crossing the border into Albania. We’ll enjoy lunch at a restaurant that specializes in fresh Albanian food and learn a little about the culture of this fascinating country. It was cut off from the rest of the world for 50 years under a communist dictatorship. Today its ruggedly beautiful landscape is slowly opening for others to enjoy. After lunch, we’ll head back to Macedonia and our hotel at the Monastery of St. Naum. The Byzantine monastery is known for being the birthplace of the Cyrillic alphabet, still being used today in most of Eastern Europe and Russia. It is also the resting place of Saint Naum and home to a flock of beautiful but noisy peacocks. We’ll dine overlooking the lagoon at the springs of the River Drim while listening to the calls of the peacock in the distance. 24 miles – 4 hours. 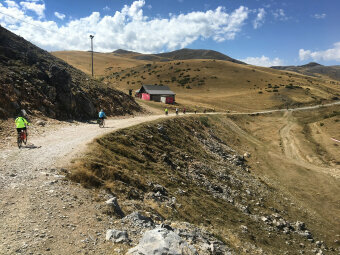 DAY 8: This morning starts with a shuttle to the top of Galicica Pass. You can admire the amazing view of Lake Ohrid before we cycle down the other side through apple orchards to Lake Prespa. We’ll have a “socialist worker style” lunch today, sitting outside on benches in a small village, eating what we’ve purchased at the country store. Toward the end of our bike ride, we’ll stop at Heraclea Lyncestis, the ancient Greek and Roman ruins with beautifully preserved mosaics. We’ll finish our ride in the lively city of Bitola in time to enjoy the nightly evening promenade in the old town before dinner. 41 miles – 5 hours. DAY 9: We’ll head to the Macedonian wine region today. Our ride will wind through villages and end up at the home of Mrs. Maria. We’ll all take part in her cooking class for our delicious lunchtime feast. We may learn to roll a stuffed grape leaf or create taratur, the delicious Macedonian cucumber dip. For a break from the bike and to work off the wonderful meal, you can choose to hike the rest of the way to our winery for the night. We’ll walk through a forest along a river, past a fish hatchery and then through the vineyards to our wine chateau hotel. 15 miles – 2 hours. DAY 10: Today we cycle into Greece! A morning shuttle takes us to Lake Dojran where we’ll start biking along its shores. You should see cormorants and egrets along the way as we cross the border. We’ll stop for coffee and delicious Greek baked goods before continuing on to lunch. We’ll fill our water bottles at a natural spring and then end our ride at Lake Kerkina. We’ll head back into Macedonia for our overnight. 33 miles – 4 hours. DAY 11: We’ll have a hearty breakfast this morning to get ready to head to our fourth country of the tour – Bulgaria! We’ll start on a bike path, cycle through our last Macedonian villages and then cross the border as we head toward the town of Melnik. It’s considered the smallest city in Bulgaria and is classified as an architectural reserve, as 96 of its buildings are cultural monuments. 29 miles – 4 hours. DAY 12: We’ll get the chance to explore these pyramids after breakfast this morning with a short hike. Once back at the hotel, we’ll change into our cycling clothes for our last bike ride as we head toward the spa region of Bulgaria and the town of Sandanski. Your afternoon is free to explore the town or to luxuriate in the thermal waters at our 5-star hotel. We’ll enjoy our last dinner of the tour together this evening. 14 miles – 3 hours. DAY 13: Our tour ends today after breakfast and a shuttle to the Sofia airport, arriving by noon. If you have the time, you should stay a night or two to explore this capital city of Bulgaria. 0 miles.